The breakup of a marriage can involve a bundle of issues over and above the end of the marital relationship itself. Money, property and children all require some degree of attention from the judicial system in a contested case. In some situations, an injunction -- a court order that somehow restrains your activity -- can be a useful device. In many family law situations, there exists the potential that one or both of you may do something that causes irreparable injury to the interests of the other party or your children. Abruptly removing the children from school and moving out of state, for example, could cause trauma. Sacking bank accounts and unilaterally liquidating retirement accounts could result in there being nothing for the court to divide -- and nothing to compensate the other spouse for her lost interests. Injunctions can prevent these things from happening. They can be issued at the beginning of a case or later when circumstances arise that make their use necessary. In some states, injunctions take effect automatically when the respondent or defendant spouse is served with the divorce papers. These injunctions usually address economic issues, such as dissipating marital property or canceling or altering insurance policies, but they can also prohibit spouses from removing the children from the state. They may be temporary, remaining in effect until the family court dissolves them or enters orders allowing limited alterations -- such as withdrawals from financial accounts to pay bills or attorneys, or allowing a party to take minor children out of the state for vacation or another permissible purpose. Some states have statutory injunctions that apply to issues of domestic violence, restraining spouses from contacting or harassing one another. These are rarely automatic and generally require the party seeking protection to file a petition with the court. In domestic violence cases, judges are sometimes empowered to enter emergency orders on an "ex parte" basis -- meaning they can enter an order right away, without giving notice to the other spouse. However, these types of orders typically have a relatively quick hearing date to give the other spouse an opportunity to defend himself. Family law varies from state to state and penalties for violating an injunction vary as well. 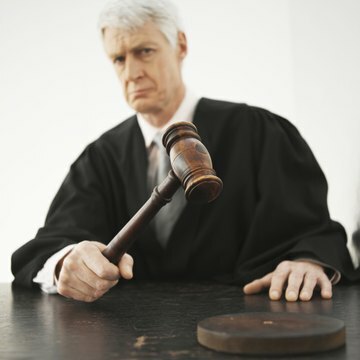 Since an injunction is a court order not to do something, doing it constitutes disobedience and, if unjustified, can seriously anger the judge who will be deciding your case. Depending upon the law of your jurisdiction, violating an injunction could expose you to fines, imprisonment, responsibility for your spouse's attorney fees and even incarceration for contempt of court. You may also suffer the dismissal of your own claims. The Switlyk Law Firm, P.A. : Injunctions and Restraining Orders: What Are They and What's The Difference? Are Restraining Orders Standard for a Divorce? A restraining order prevents a person from taking a certain action, and two types of restraining orders are common in the context of divorce: automatic restraining orders and domestic violence restraining orders. Though laws regarding this issue differ between states, an automatic restraining order typically keeps spouses from actions like selling property or moving the children, whereas a domestic violence restraining order keeps spouses away from each other.